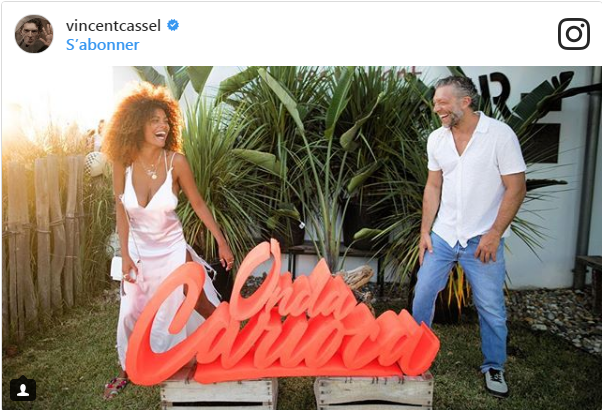 Vincent Cassel and Tina Kunakey were caught during their vacation in Brazil. The former husband of Monica Bellucci - Vincent Cassel recently turned 51 years old, and many fans assumed that the age difference (the beloved of actor Tina Kunakey is 24), was the reason why the couple suddenly broke up. True, the main reason cited had been the rapper A $ AP Rocky with which the model began to spend more and more time in New York, However, Cassel on this New Year's week seems to have wiped gossipers out. First he posted a photo with the Brazilian family (he is now on holidays in Rio de Janeiro), where he showed off a toned body with dice and pumped up biceps, and a little later he shared the picture with Tina. And what a picture! In the picture, shared to Instagram, Vincent is seen looking at the camera, while the beautiful model is wearing a dress from a new collection of Victoria Secret. Vincent smiles slyly: well, what other questions are there ?! By the way, a little earlier photographers caught the same couple in one of the most prestigious areas of Rio - Leblon, where the local beach is located. They were walking along the street with their friends and seemed not to notice the photographers and felt relaxed. In general, it seems, if there were any issues, Tina and Vincent could already resolve them all. Everything is good in the personal life of the former wife of Cassel - Monica Bellucci. True, she does not want her relationship to be public now. Recently, the actress told that she stopped appreciating in men the beauty and youth. Now, Monica Bellucci is much more attracted to men with wrinkles. "Traces of time on the face and body help not to be distracted from the main thing - so we see the soul better," she believes. Bellucci said that she had recently found a new love. "Now there is a man in my life, but I can not say more. I need some privacy. A new chapter in my life begins, "Monica frankly concluded in an interview with Paris Match magazine.